For me, raw-edge fusible applique is the simplest type of applique to use. Basically, fuse the back of some fabric, cut out some shapes, then iron them to fuse them to a block. Stitch along the edges of your appliques and you're done! The only downside to raw-edge applique for me is that the edges can unravel. 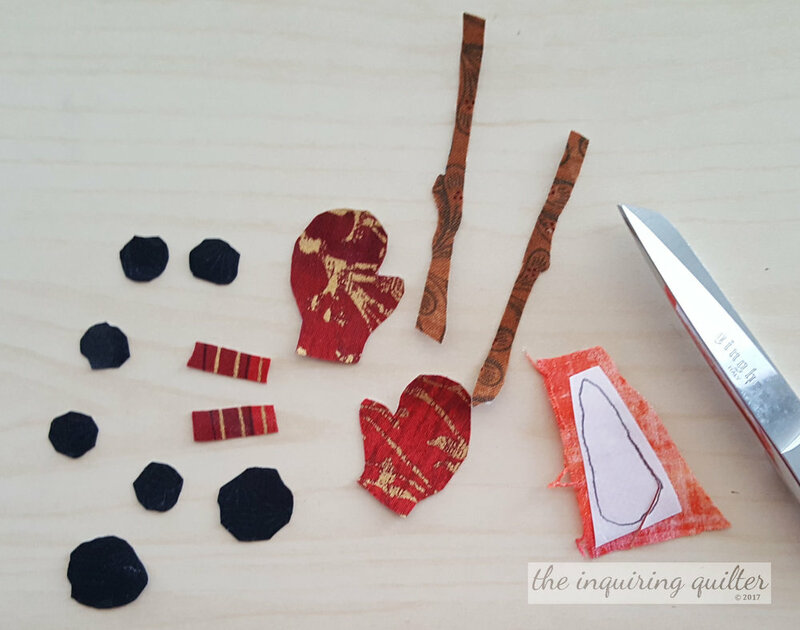 To prevent that, I use the Crafted Applique method, which tells you to apply fabric Mod-Podge to the edges of your applique to seal them so they can't unravel. Start by tracing your shapes onto the backside of your fusible web. I trace shapes in groups, grouped by the same fabric. So for the snowman, I traced the black shapes together as a group, to make it easier to fuse them to the back of the black fabric later. I prefer Heat n Bond Light because you don't have to use steam to fuse it but I've also used Steam a Seam 2 and Wonder Under with great success. Before you trace them, make sure the applique shapes are reversed--the opposite of how they should appear in the block. Cut the applique shapes out of the fusible roughly, outside the dark lines. If you've grouped them, cut out the group roughly. For example, I cut out my black coal eyes and smile together. Fuse the shapes to the back of your fabric following manufacturer's directions. I like to use a pressing sheet to protect my ironing board and my iron from the sticky fusible. If you get fusible on your iron, you can remove it with a used dryer sheet on a warm iron. Cut out the shapes exactly on the dark outline. I recommend cutting a larger block background than you'll need. For example, if you want a 12-1/2" block, cut your background 13-1/2". After you fuse the applique shapes and then edge-stitch them in the next step, the background often shrinks up just a bit. By cutting your background larger than needed, you can trim it after everything is done to the exact size required. Arrange the shapes and fuse them to the block following manufacturer's directions. If you are fusing a complex image such as this angel, you can fuse the parts together on a Teflon pressing sheet, then move the fused shape to your block background for positioning and final fusing. To help you assemble the image, trace the pattern on the back of the applique template sheet included in your pattern. Place the tracing underneath your pressing sheet, and use the lines to arrange and fuse the parts of your complex image together. 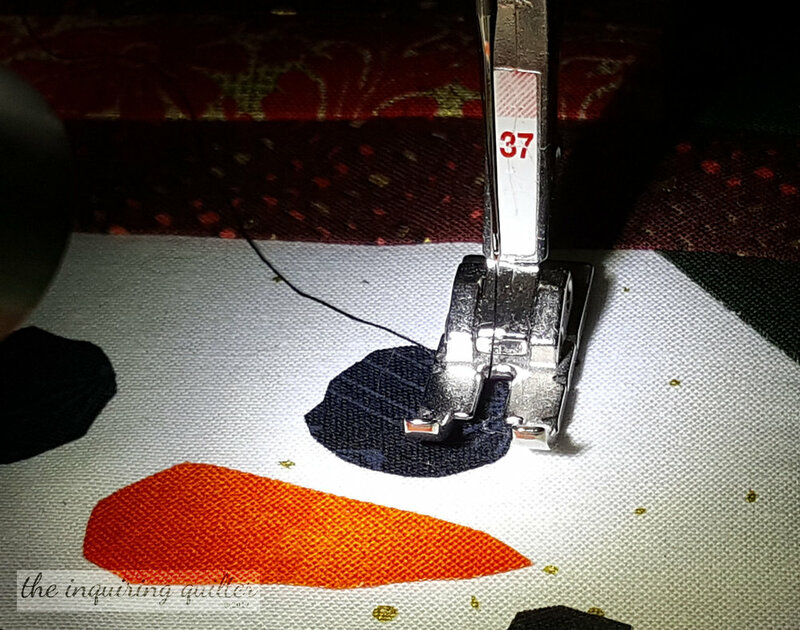 To finish the raw edges of your applique, you edge-stitch them (stitch along the edge). You can use a straight-stitch, small zig-zag, blanket stitch, satin stitch or other decorative stitch for this purpose. 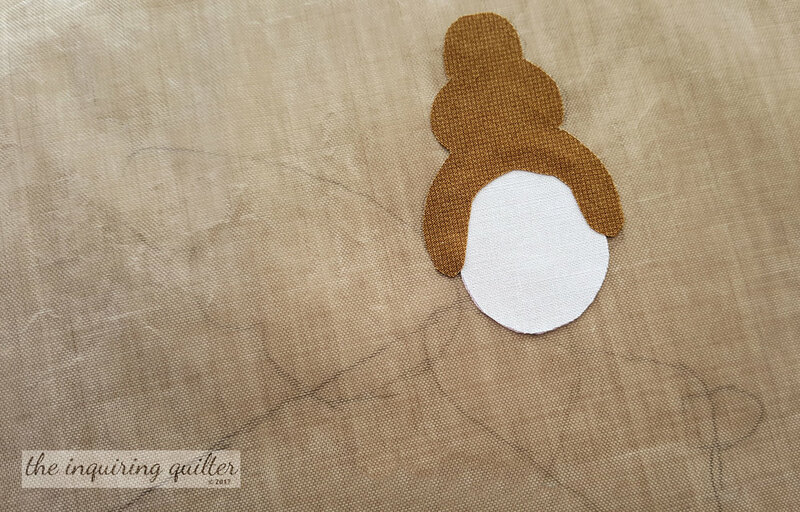 Match the color thread to the color of the applique shape. If you decide to satin-stitch the edges of your appliques, fuse a light-weight wash-away stabilizer to the back of your block. The stabilizer will help prevent the block from gathering up under the weight of the tight satin stitching. Remove the excess stabilizer after stitching.